On this 30th anniversary of the broadcast of the Top Gear FF episode (14th April 1988) it seems appropriate to upload a new photo from the filming. 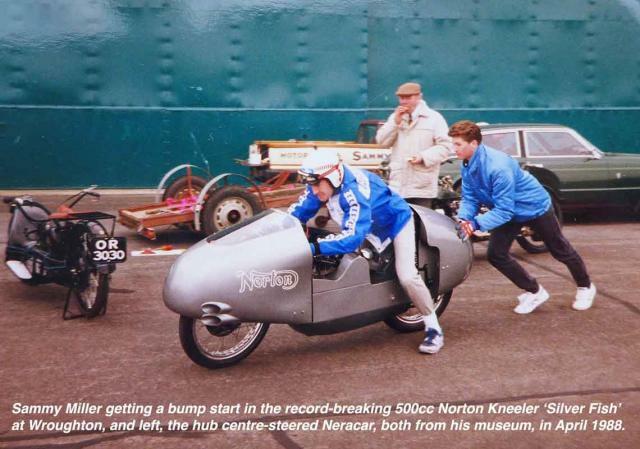 Here we see Sammy Miller getting a push on the record-breaking 1953 Norton Kneeler at Wroughton. His Neracar is on the left. Submitted by Royce on 16-Apr-18 9:03am. There's something more than just ironic about this pic, taken at one of the biggest gatherings of FF's ever assembled at that point. When Norton made this bike there had been several decades of research and a world war, demonstrating that the reclining position was better than the prone position for controlling any sort of vehicle you may like to mention. It's not even difficult to demonstrate this at home - you just need a plank. But this didn't deter Britain's leading racing motorised bicycle manufacturer, they just carried on the noble tradition of doing the wrong thing, whatever that was. The surprising thing is that the industry lasted as long as the mid-seventies, not that it collapsed in ten years. Subsequently of course several generations of two wheeler enthusiasts persisted in doing the wrong thing globally, not a small reason for the steady decline into irrelevence for what could otherwise be a major contribution to efficient transport. This Norton is a revered part of a collection, while A.V.Roe's rather advanced FF, of a similar vintage, languishes unseen in another museum storage facility (The hanger in the backgound). This pretty much sums up British attitudes to industry and innovation, Wall to wall and tree top tall! Monocar on public display in Southampton Museum for many years! Submitted by paulblez on 16-Apr-18 11:42am. Royce, there's a further irony. The fact that the Sir Alliot Verdon-Roe's 1926 Monocar has been prominently displayed in the Southampton Aviation Museum for at least 15 years, and my photo of it there has been on this very website for well over a decade, where 8,449 people have viewed it since 2006. But not you, clearly!